Looking for a fun corporate office outing that has something for everyone? Not interested in doing the same old thing? Well then you came to the right spot! The Detroit Rolling Pub is the #1 Pedal Bar in Detroit and specializes in corporate outings. Whether you have a group of 6 people or up to 64 it doesn’t matter! Our pedal pub can handle you! 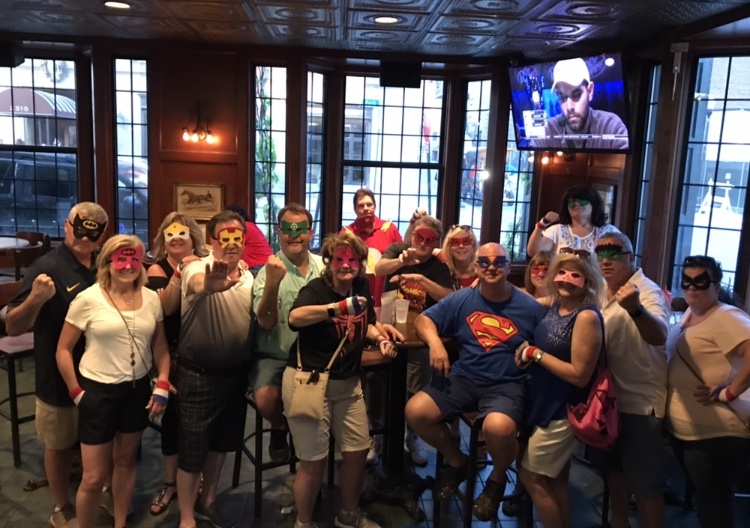 We specialize in Team Building activities that include: Scavenger Hunts, Historical Tours or our most loved Bar Hop Tour. We work with you to coordinate the best tour for your group. Let us know what you are thinking and we can plan accordingly to make sure this corporate outing is one everyone will be talking about for a long time to come! Detroit Rolling Pub has partnered with the best restaurants in the city to be able to offer you ideal locations for lunch or dinner before or after your tour. We also have access to large group seating at Punch Bowl Social to accommodate your team. We also work with Exodos, Downtown Louies and Bookies Bar and Grille to offer you a wide selection of dining experiences and options. We will help coordinate the right person to talk to at each establishment. If you are not looking for a private event, just looking for a lot of seats, all of these places will accommodate free of charge! Just another benefit of Detroit Rolling Pub! There is no charge to set anything up on our end. We want you to have the best experience possible and if there’s anything we can do to help make your pedal bar experience even better let us know!